sound and style – Cashman & West, Batdorf & Rodney, for example, but Brewer & Shipley were a marked cut above the smooth strummers and moustachioed harmonists. Their sound had (and still has, because they’re still regularly gigging in the USA) a greater sense of the wide open spaces of their US heartland home base; it’s no surprise that one of their albums was called Rural Space, as their music is suffused with that kind of ambience. The underlying lyrical themes of the duo were recurrent motifs of personal freedom and an opportunity to pursue an alternative American Dream to that of the vast majority of the US middle class, as well as orthodox songs of love. Weeds, the first of the two albums featured here, was recorded in 1969, and was the duos’ second album. Their debut album Down In LA, had been cut for the A&M label in Los Angeles the previous year. They’d been playing the West Coast folk and coffee bar circuit, and the original plan was for them to make a living as writers as well as performers. They had moderate success in this regard; Chicago psychedelic weirdoes HP Lovecraft had cut a version of their "Keeper Of The Keys", sung in a bizarre, semi-operatic style, on their HP Lovecraft II album. Down In LA was pleasant enough, cut with a bunch of LA session luminaries such as Leon Russell and Jim Messina, but it didn’t make much headway, commercially, and anyway, Brewer & Shipley didn’t care much for the Los Angeles scene, moving back to Kansas City, and set up their own production company, Good Karma. The A&M management figured that they’d quit the music business, instead of just quitting La La Land, and so didn’t bother to pick up their option. Instead, Brewer & Shipley signed to the Kama Sutra / Buddah label, helmed by Neil Bogart. Up until then, Bogart had a reputation as being the ‘King of Bubblegum’ and seemingly specialised in goofy, frothy pop confections. He’d also been at the Cameo-Parkway label, where he’d foisted Chubby Checker onto the world of pop, and had struck chart paydirt at Buddah with the likes of The Lemon Pipers and 1910 Fruitgum Company, but wanted to show that he could move into the alternative sphere, too, and signed acts to the label as varied as Melanie Safka, The Flamin’ Groovies and, of course Brewer & Shipley. Weeds was recorded in San Francisco, and produced by Electric Flag guitarist Nick Gravenites, who assembled a bunch of excellent players in the backing band, including guitarist Mike Bloomfield, keyboard player Mark Naftalin, and even roped Grateful Dead main man Jerry Garcia into the fold to provide a dab of steel guitar. The tight combo backings are superb throughout; there’s a nice sense of freshness and space in the sound, and the duo’s soaring vocal harmonies, as well as their obvious melodic skills have a refreshing urgency about them that still sounds invigorating and plaintive. As well as their excellent originals, the album’s two covers are equally fine; a strident take on Dylan’s "All Along The Watchtower", and the delightful "Wichi-Tai-To". The latter is a minor underground classic, penned by Jim Pepper, a kind of Native American chanted mantra, with a three chord musical progression somewhat redolent of Sweet Jane by the Velvet Underground. The track had originally been cut by a band called Everything Is Everything, and was covered a little later by Harpers Bizarre, and apparently Brewer & Shipley heard in played on various radio stations when they were out touring, and learned it phonetically. Despite it’s seven minutes of playing time, it insistently builds to a powerful, lasting effect. It’s one of the highlights of a strong and vibrant collection of quality late 60s US Folk Rock. Tarkio, their next album, was recorded in 1970, and picks up where Weeds left off; more strong harmonising, Gravenites producing, and several of the same players on board for the return match. It also boasted a fluke hit single in "One Toke Over The Line", which had started off as a kind of jokey novelty item played as an encore when the duo opened for label-mate Melanie in New York, but label MD Bogart thought he heard hit potential in the song, and insisted the duo release it as a single – and it charted, despite the opprobrium of the US establishment. Other songs like "Song From The Platte River" mourned the loss of personal freedoms in contemporary America, a theme echoed and embellished on Fifty States of Freedom. There’s subversive wit and humour too, in an agreeable ten-track collection that never overstays its welcome, thanks to some fine ensemble playing, excellent songs and wonderful punchy harmony vocal work. 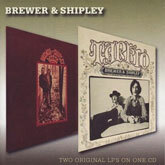 Although Brewer & Shipley hardly warrant much more than a footnote in Rock encyclopedia, the two albums featured herein are proof positive that their relative obscurity is unjust in the extreme. The subject matter of their songs is as valid now as thirty-odd years ago, and the music is fresh, colourful and vibrant. And the guys are still out there, doing it – a little less hirsute, but as passionate and committed as ever. More power to ‘em, I say.